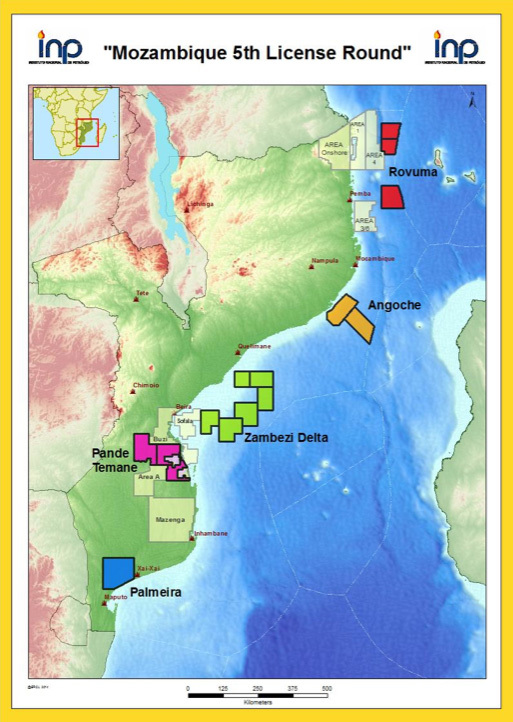 The Institute of National Petroleum of Mozambique (INP), is pleased to announce the results of the fifth competitive bidding round for Exploration and Production Concession Contracts. The Institute of National Petroleum of Mozambique (INP), announced the results of the fifth competitive bidding round for Exploration and Production Concession Contracts on the 28th October 2015. The fifth round commenced on the 23rd October 2015 and companies had nine months to evaluate the available technical data and formulate their applications. The round followed a competitive bid process that evaluated the bids on defined published criteria which included Health Safety and Environmental (HSE), financial strength, technical competence / capability and the Economic terms offered to the Mozambican State. A total of fifteen Areas were included from within offshore Rovuma, offshore Angoche, offshore Zambezi, onshore Pande-Temane and onshore Palmeira covering approximately 74,259 sq kms. Bids were received from potential Operators for eight of the fifteen areas on offer. After evaluation of the bids, the following Operator lead groups have been invited to commence negotiations for an Exploration Production Concession Contract. Angoche Area A5-B ExxonMobil E&P Mozambique Offshore Ltd.
Zambezi Area A5-C ExxonMobil E&P Mozambique Offshore Ltd.
Zambezi Area A5-D ExxonMobil E&P Mozambique Offshore Ltd.
Pande/Temane Area PT5-C Sasol Petroleum Mozambique Exploration Ltd.
Palmeira Area P5-A Delonex Energy Ltd.
Information can be found on: www.inp-mz.com and www.inp.gov.mz.